My husband and I bought our Estate washer three years ago, as our first washer for our new apartment. We purchased it through an R.C. Willey store in Utah, and basically chose it because it was about the cheapest one available (about $300 new). It was available in 2 or 3 different capacities as well, and we chose the middle one. That being said though, we have been quite pleased with its performance and have never had a single problem with it in the three years that we have regularly used it. Estate is actually a Whirlpool brand, so that gives it a little more familiarity in the quality. While it is nothing fancy, it has worked really well for us and our five or so laundry loads a week. 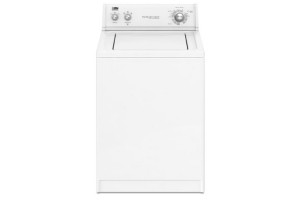 The Estate makes a pretty basic washer, but it does have a regular, delicate, and permanent press cycle selections. There are also 3 temperature selections. I do wish the delicate cycle was a bit more delicate, but it gets the job done ok. It can also handle quite a large load without a problem. It does not rebalance itself automatically if a load gets lopsided, so you have to run to it to try to fix that, but that has only happened a few times with ours. The only other major setback about this washer is that there is nowhere to pour the fabric softener where it automatically is dispensed at the appropriate time in the cycle. So we have to either mix it in at the beginning or run downstairs in the middle of a cycle to put it in, sometimes forgetting. Another option to solve that, of course, is a softener ball. Although it is certainly a basic washing machine, our Estate washer has worked really well for us with absolutely no major problems for just over three years now. It has been easy (albeit heavy) to move and hook up, and our clothes are always much cleaner when they started! I would highly recommend this if you are on a tight budget and just want something nice and new that is reliable and functions well. I bought one of these four years ago to serve the needs if a family of six and have had zero problems.Basic no frills machine with matching dryer. Highly recommend! Our estae washer lasted 3 years..we replaced a valve before the 1st year was over..again the next year. Leaked horrible...put in a new tranmission. After that several washer repair men we still could not figure out why some times it wash sometimes it did not. The said it was either the timer or something else. This was the worst washer I have every have. Do not buy this. I now have a new washer and it actually works. We are in need of a washing machine because ours has broken after a reliable 15 years of service. We need something cheap and reliable. We do prefer a fabric softner dispenser but guess we could use a frabric softner ball like you suggested.